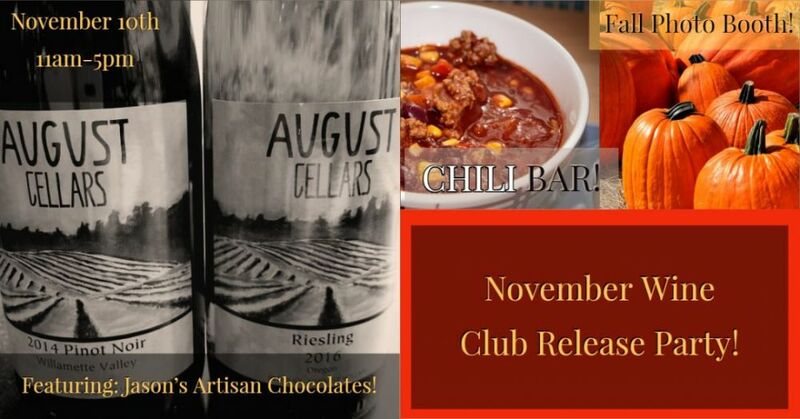 November Wine Club release party is open to everyone! We're releasing our 2014 Willamette Valley Pinot Noir and our 2016 Riesling! Come celebrate these two wines, and more, on November 10th with us! There will be a Chili Bar! Meat and Vegetarian chili available! And LOADS of good toppings to complete your chili bowl. And don't miss out on our "Fall Photo Op" spot. We'll have an area set up for the perfect Instagram photo op, we even have props! Jason's Artisan Chocolates will be selling their amazing chocolate creations that day, so bring your spending money. Celebrate our new wine releases! For Everyone!